The Toronto Maple Leafs are on the verge of becoming one of the league's leading Stanley Cup contenders. Strangely enough, the move that might put them over the top could be trading their leading scorer and franchise player, Auston Matthews. Moving Matthews would free up the large amount of cap space required to keep him when his entry-level contract expires at the end of the 2018-19 season. It would help the team acquire the top-pair defenseman it needs far more urgently than a high-scoring forward. The return could be an Eric Lindros-like windfall of picks and prospects -- including that top defenseman -- if a bidding war were to erupt due to the gap between his perceived and actual value. Let's consider each of these three factors in turn to determine if there's any merit to this seemingly ridiculous concept, along with a look at the teams that could engineer packages the Maple Leafs would be foolish not to consider. On July 5, the Edmonton Oilers signed Connor McDavid to an eight-year, $100 million contract. There's speculation that Matthews will sign a similar contract before his current entry-level deal expires in the 2019 offseason. To make sure there's enough cap space for when McDavid's new contract kicks in for the 2018-19 season, the Oilers bought out Benoit Pouliot and traded away players like Taylor Hall and Jordan Eberle. The loss of those key forwards has arguably knocked the Oilers out of playoff contention. In the case of Matthews, will the Maple Leafs be forced to part ways with one or more of this summer's unrestricted free agents, a crew that includes James van Riemsdyk, Tyler Bozak and Leo Komarov? Will they be forced to trade away restricted free agents William Nylander and Mitch Marner, whose entry-level contracts expire in 2018 and 2019, respectively? NHL GMs on the hot seat: Who deserves it? Toronto's best option can be determined objectively by looking at a player's value relative to the cap and moving whoever offers the least future bang for the buck, whether that's Matthews or not. To summarize a process laid out in the opening chapter of Stat Shot, a player's value is estimated using a three-year weighted average of a catchall statistic like GVT or WAR and regressed slightly toward the league average to account for random variation. To project it forward, an age curve is applied to account for how players improve until their peak between ages 23 and 25 and how they decline in their 30s. Finally, a player's cap-relative value is determined by comparing that final value to what a team would expect using the same cap space elsewhere, based on the league minimum and projected salary cap that season. If his new contract carries an annual cap hit of $12.5 million or more, then Matthews is projected to cost the team about 20 goals over its entire length, relative to what Toronto would receive by investing the same cap space elsewhere. Regardless of how much he contributes, that could make his contract the least valuable of the listed players -- and therefore the one for the Leafs to theoretically move. Essentially, the issue is that McDavid and Matthews aren't the same player and shouldn't have the same contract. McDavid is arguably the best player in hockey, and he led the NHL with a WAR of 25.8 last season, according to Corsica Hockey. Despite his 40 goals, Matthews ranked No. 35 with a WAR of 9.8. Even in terms of points per game, McDavid averaged 2.92 points per 60 minutes at 5-on-5, which ranked second to Pittsburgh Penguins forward Conor Sheary (3.01), according to the data at XtraHockeyStats. Matthews ranked No. 33 with 2.17. In terms of shot-based metrics, McDavid boosted Edmonton's share of all on-ice shot attempts from 48.39 to 53.05 percent for a Relative Corsi of plus-4.66 percent. Matthews was also quite strong, but notably worse at plus-1.55 percent. Matthews is a great hockey player. There's no denying that. But he's also not McDavid. If it takes the same kind of contract to keep him in Toronto, then the disconnect between what he brings and how much cap space he requires means that he should be the player who is moved, especially since it means that van Riemsdyk, Bozak, Nylander and Marner can all be kept instead. Losing a player like Matthews isn't the major blow for the Leafs that it would be to another organization. With or without Matthews, Toronto has plenty of scoring up front. Last season, it was the only team with five forwards who reached 60 points. The Leafs also had five forwards who scored 20 goals, which ranked second to the Chicago Blackhawks, who had six. Plus, Marner had 19 and Bozak had 18, and they added free agent Patrick Marleau, who had 27. Connor Brown could add his name to the list this season, giving them potentially three full lines of 20-goal-scorer talent. The Maple Leafs really need a top-pair defenseman, rather than the scoring that Matthews provides. It is arguably the only missing piece that is preventing Toronto from being a top Cup contender right now. Toronto's roster requirements can be best illustrated in a player usage chart, such as the following from Hockey Abstract 2017. Based on a three-year weighted average, players are placed on the chart based on how they are deployed. The average number of faceoffs for which they line up in the offensive zone relative to the defensive zone is on the horizontal axis, the average quality of their opponents is on the vertical axis, and the sized and shaded circles represent how well the team does from a shot-based perspective with that player on the ice relative to when he isn't. The result is that those playing the toughest minutes in all zones will be at the top of the chart and toward the middle horizontally, the more offensive-minded players will be on the far right and the more sheltered, secondary players will be located along the bottom. Based on the shaded circles that denote good shot-based metrics, the Maple Leafs clearly have an abundance of effective top-six forwards, starting with Matthews on the far right, but expanding to Zach Hyman, van Riemsdyk, Marner, Nylander, Bozak and Brown. 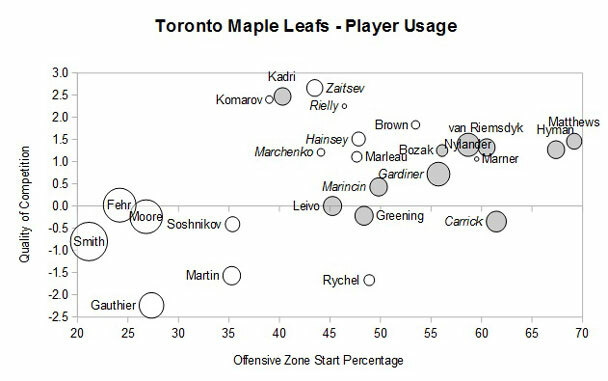 Closer to the top-left side of the chart, the Leafs have the veteran line of Marleau, Nazem Kadri and Komarov handling the tough minutes. In terms of depth, they still have nine more forwards on the chart, several of whom could easily handle more challenging roles. In contrast, the blue line (denoted in italics) isn't nearly as deep. While Morgan Rielly has certainly established himself as an effective top-pair defenseman, the white circles suggest that Nikita Zaitsev and Ron Hainsey would be more effective further down the depth chart. Jake Gardiner has a large shaded circle denoting strong shot-based metrics, but his position on the chart is more typical of a scoring-focused second-pair defenseman, similar to Boston Bruins blueliner Torey Krug, the Philadelphia Flyers' Shayne Gostisbehere or New York Rangers power-play quarterback Kevin Shattenkirk. The Maple Leafs need someone who can effectively play top-pair minutes in both zones, like Rielly. Trading Matthews could be just the way to acquire such a player. Unquestionably, the most compelling argument in favor of trading Matthews is the possible return. Obviously, it makes very little sense to trade a superstar for a marginal pick and a prospect, but imagine if Toronto received a particularly serious offer that included a top-pair defenseman along with a top prospect and/or an early draft pick. As a point of comparison, consider the bidding war the erupted when the Quebec Nordiques put Eric Lindros on the trading block 25 years ago. After receiving several equally generous offers, the Nordiques traded Lindros at the 1992 NHL draft to the Flyers in what was ranked in Stat Shot as the third-most one-sided trade in history. The Nordiques received Peter Forsberg, Steve Duchesne, Mike Ricci, Ron Hextall, Chris Simon, Kerry Huffman, two first-round picks used on Jocelyn Thibault and Nolan Baumgartner and $15 million. They doubled their total of 52 points in the standings in 1991-92 to 104 in 1992-93 and won their first Stanley Cup in 1995-96 (as the Colorado Avalanche). That's what happens when hype meets hysteria, and the Maple Leafs could enjoy the same kind of windfall for Matthews in the right situation. Specifically, they could get a top-pair defenseman, a collection of good prospects and early draft picks and some useful role players. For example, in eagerness to bring Matthews back home to Arizona, it is conceivable that the Coyotes could offer a package that included Oliver Ekman-Larsson, another young NHL player and a 2018 first-round pick that is likely to be in the top five. The Carolina Hurricanes would also make an interesting trade partner because they have solid young defensemen like Justin Faulk, Jaccob Slavin, Brett Pesce and Noah Hanifin but are without a lot of scoring strength down the middle. They're a team on the rise in a tough division that might make the kind of offer that would attract Toronto's attention. The key to this whole venture isn't to trade Matthews for whatever the Maple Leafs can get, but rather to see just how high the trade offers may rise and to be prepared to jump at one that includes a top-pair defenseman and valuable future assets. A lot of assumptions were made in this argument, some of which may prove to be invalid. Matthews may be worth more than can be captured using today's catchall stats, he may sign a far more reasonable contract than expected and/or his trade value may not be nearly as high as assumed. Furthermore, there are always non-hockey considerations at play, such as his locker room leadership, on- and off-ice intangibles and his value to both the team and the local community. That's why the argument isn't to get on the phone and to move Matthews right away. Instead, Toronto should try to remain objective about his contributions and not only be willing to listen to reasonable trade offers but to proactively propose a few of its own.